2010: Two Muslim NFL players, Husain Abdullah and Hamza Abdullah, do not eat or drink for a month during the daylight on NFL practice and game days, and they took time out in the day to pray. Players and coaches supported their fasting. Obama even invited these Muslim players to the White House. One coach even fasted with them for a couple of days. SNL doesn’t dare criticize them or the Muslim faith and the Media has highlighted their actions in a positive light. Tim Tebow has been one of the most sensational NFL players this season. He has won several games with last minute heroics. Tebow can sometimes be seen kneeling down on the sideline of a game to say a prayer. This has been called “Tebowing.” Although Tebow publicly practices his faith and praises God, he is very humble and has never stated that God is on his side and that is the reason why the Broncos are winning. Tebow works hard in practice and in games to try to help his team win. Recently, Detroit Lions player Tony Scheffler and Stephen Tulluch kneeled in a game against the Broncos, clearly to mock the prayer that Tebow does. Former Broncos Quarterback Jake Plummer publicly stated that he does not like that Tebow publicly practices his faith. Saturday Night Live (SNL) recently did a show mocking Christianity and, specifically, Tim Tebow’s public expression of faith. 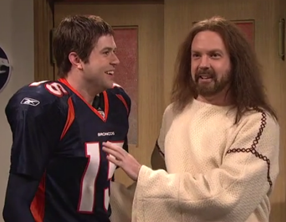 SNL’s skit depicted a fake Jesus telling Tebow to stop openly practicing his faith and to read a football playbook instead of just relying on God to win games for him. Muslim NFL players, Husain Abdullah and Hamza Abdullah, observe Ramadan, the Islamic month of fasting and prayer, every year. They will not eat or drink at all during daylight hours for the entire month of Ramadan. This includes no drinking water during practices and games. Husain Abdullah openly says that Allah is always first before the NFL. He even says that Allah is his nourishment during the day when he does not eat or drink, and also that fasting helped him play better to get drafted. The NFL coaches and players went out of their way to support and encourage these two Muslims openly practicing their faith. The Minnesota Vikings had Husain Abdullah work with the team's nutritionist on a meal and hydration plan. Hamza Abdullah openly encouraged teammates, trainers and coaches to fast with him. Some players agreed to only drink water, and even head athletic trainer Eric Sugarman agreed to fast for a day or two. While Hamza was fasting, Cardinals cornerback Michael Adams told him that he seems like he is really at peace. The Abdullah brothers were even invited to Obama’s Iftar dinner at the White House to celebrate the Muslim holy month of Ramadan. What if SNL were to do a show where Mohammed told the Abdullah brothers that not drinking water during practice is silly and that Jesus is the real Son of God. What if SNL, whose studio is mere miles from where Muslims killed 3000 Americans, did a skit where these Muslim players were asked to read the football playbook more instead of the Koran, and to stay away from the terrorist playbooks that some Muslims followed when they attached America on 9/11. All Hell would break lose if that happened and Muslims terrorists might even attack the SNL studio like when the Muslims rioted when a Danish cartoon simply poked fun at Allah, killing many innocent people.